this is the only picture that was listed for the set, if anyone has any ideas, I would be glad to hear it. I think you’re right, the lenses speak of the 16-mm. format. What’s nice about the offer, you have the rackover with it, so you’ll be able to do exact work. The sidefinder is not very accurate framing-wise. Focusing by the prism is perfect, macro shots with extension rings/tubes included. The camera most certainly is in need of cleaning and fresh lubricants. Better don’t run it at higher speeds because dry bearings will soon begin to wear out. 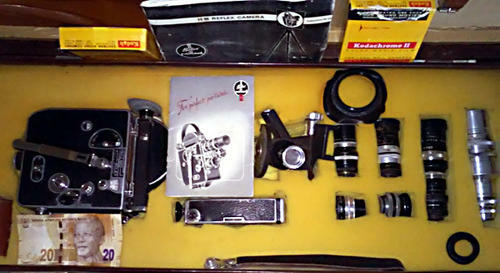 I have serviced many Paillard-Bolex H cameras, older and younger models. The photocopied manual reads H8 BOLEX CAMERA, and my first thought looking the picture was that a H8 and a bunch of d-mount lenses. But, we will see. I was a pretty occupied trying to give the lenses a look over, still seems to be a 25mm switar in the mix which would cover the cost of the purchase. It might have a d mount adapter on it, the big silver one still keeps a bit of hope but as you said we will see. I'll post some pics when I get it. I've stared at the pic, and now I think the manual reads H8 REFLEX CAMERA. The camera is not a reflex body. This can be a very mixed lot. Just the kind I like to buy when they come my way. They look like C mount lenses to me. Rob you were pretty close, quite pleased with the set. Layer-cake, I’d love to read your statement about that Paillard-Bolex-H system of racking the camera (diagonally) over and focussing with the prism behind the turret top lens port. How practical do you find it?